We have ofen see people struggling with Elastic search basic interview question. In this post i will try to give you what are the top 10 Elastic search interview question, that you should know before going for any interview. Before that i would highly recommond you to check this blog, in this blog post i gave basic uderstanding of Elastic search. 1. What Is Elasticsearch ? 2. 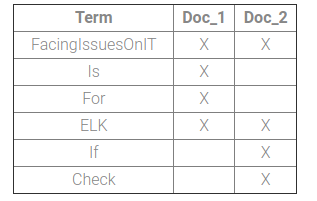 What are document,index,indexing and inverted index in Elastic serarch? A document in Elastic search can be considered as a row in relational database. A document might have different data types. An Index in Elastic search can be considered as a table in relational database. An Index will have multiple documentes. It is not nessery to have all the documents with same schema, we can force same schema but it is not mendaory like in relational databases, where we have difiened schema at table level. Inserting documants in index is called as indexing. Inverted Index is backbone of Elasticsearch which make full-text search fast.Inverted index consists of a list of all unique words that occurs in documents and for each word, maintain a list of documents number and positions in which it appears. For Example: There are two documents and having content as: 1: FacingIssuesOnIT is for ELK. 2: If ELK check FacingIssuesOnIT. To make inverted index each document will split in words and create below sorted index. Now when we do some full-text search for String will sort documents based on existence and occurrence of matching counts. Usually in Books we have inverted indexes on last pages. Based on the word we can thus find the page on which the word exists. 3. What are shards and replicas in Elastic Search? 4. What Is The Query Language Of Elasticsearch ? 5. 4. What is a Node in Elasticsearch? A Master node is a node that controls the entire cluster. A data node is a node that holds data in it and performs logical operations on the data. An Ingest node is a node that can be used to ingest pipeline which means a series of processors to a document to perform some transformations before indexing the document. A Tribe node is a node that performs some coordination to connect to multiple clusters across all the connected clusters and perform some logical operations or searches. By default, a node will always be a master node and a data node, but depending on the large requirements, node configurations should be carried out. 5. What Is A Cluster In Elasticsearch ? Cluster is a collection of one or more nodes (servers) that together holds your entire data and provides federated indexing and search capabilities across all nodes. A cluster is identified by a unique name which by default is “elasticsearch”. This name is important because a node can only be part of a cluster if the node is set up to join the cluster by its name. 6. What is a Tokenizer in ElasticSearch ? Tokenizers are used to break a string down into a stream of terms or tokens. A simple tokenizer might split the string up into terms wherever it encounters whitespace or punctuation. Elasticsearch has a number of built in tokenizers which can be used to build custom analyzers.